We supply one of the most comprehensive ranges of Large Digital LED Displays available, with an estimate of over 900 bespoke and standard Displays. Sales of our products are worldwide. We have assembly facilities in the UK and Far East and Sales Offices in the UK, Europe, USA / Canada. Our LED digital A to D Displays accept all standard industrial input signals Voltage and Current and all are scalable. Features include Alarm and re-transmission, case protection IP54, IP65 ( NEMA 13 and NEMA 4 ), number of digits 3, 4, 5 scale ranges and digit heights from 2.3”-18”. 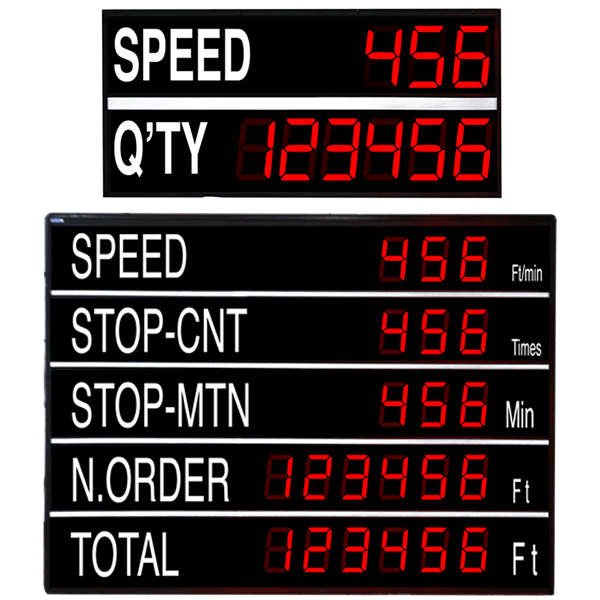 These LED displays will display any engineering units with decimal point position programmable. 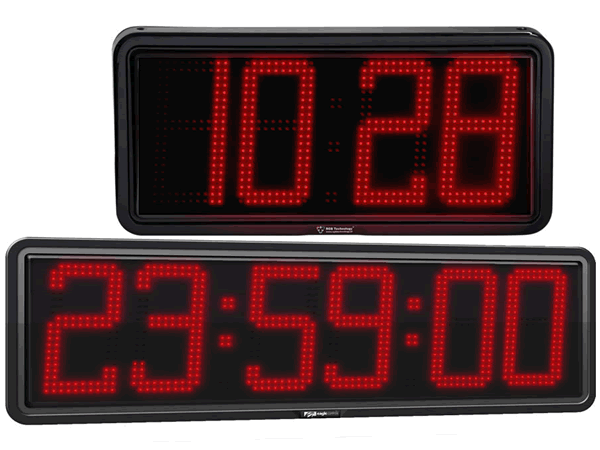 Our LED digital Clocks set a new Industry standard. Time bases Hrs : Mins : Secs or Hrs : Mins. Auto Dimming, GPS control, IP54 and IP66 ( NEMA 13 and NEMA 4X ) rated cases, Indoor or Outdoor. The Clocks also allow the display of Date / Year & Temperature alternating. Wall, suspension mounting, single or double sided. 2.3” to 16” digits Red, Amber, Blue, Green, White, Yellow LED options. 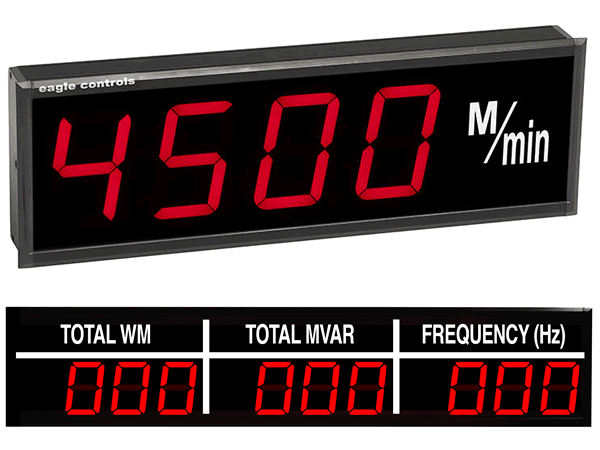 Our LED Digital Counters will accept standard input signals, contact closure, 24Vdc, NPN, PNP, Quadrature and are available from 2 digits to 12 digits in digit heights from 2.3”-18”. UP or DOWN, BATCH or TOTALISING count, single line or multiline, IP55 or IP65 ( NEMA 13 or NEMA 4 ). 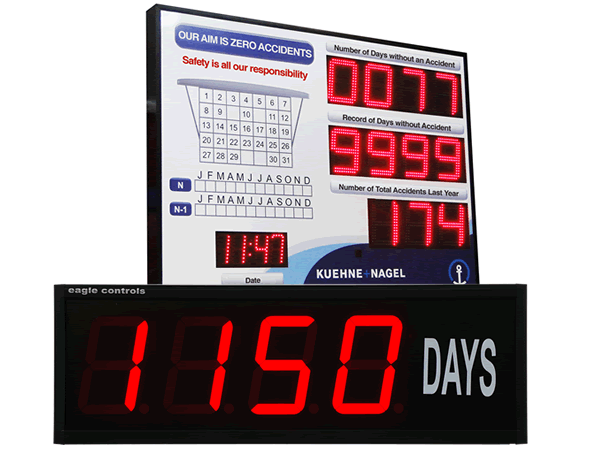 LED numerical display of Days Since Last Accident, LED numerical record of Best Month / Year to Date, single line or multiline panels. IR Remote control LED digits from 2.3” to 16” and LED displays from 2-4 digits. IP55 or IP65 ( NEMA 13 or NEMA 4 ). 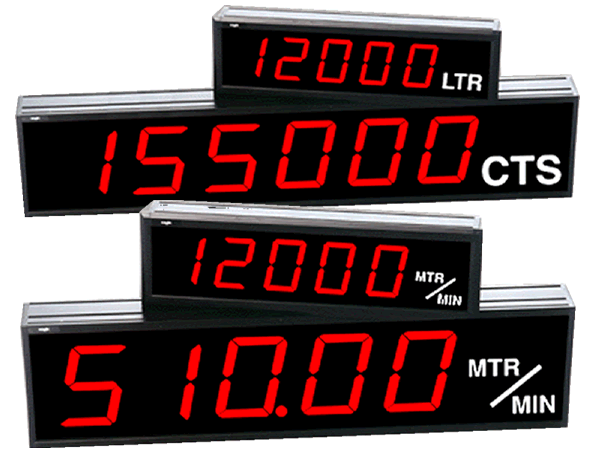 These multiline LED Digital Displays allow total production activity to be displayed at all times. The displays can be single or double sided and wall our suspension mounted. 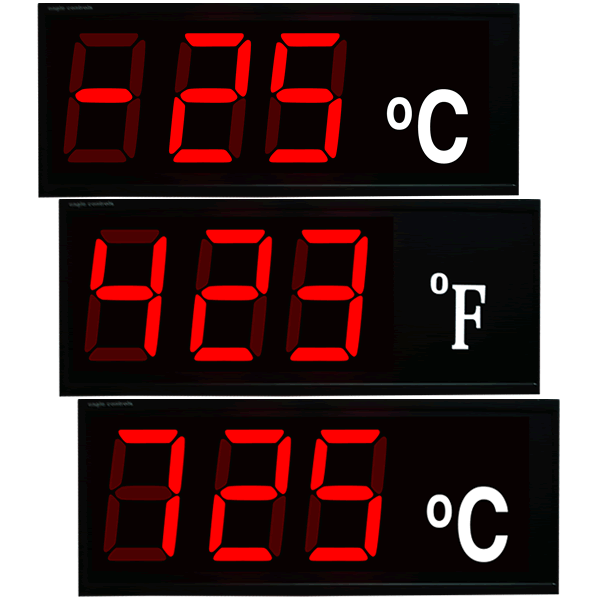 A wide variety of inputs can be applied to the displays, showing Time, Counts, any Engineering units and Temperature. Lines can be from 2 to 12 deep with a variety of LED Digit heights and number of digits per line. 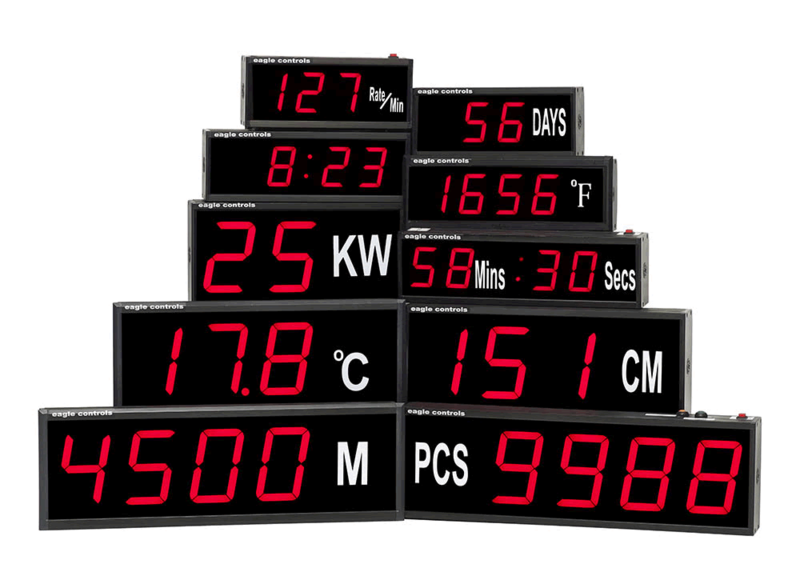 Our Digital LED Temperature Displays are probably the most comprehensive range on the market covering Industrial and Commercial applications from -200~1600°C / -328~2912°F. Thermocouple and PT100 (RTD ) inputs Panel, Wall or Suspension mounting Alarm and re-transmission outputs, 2,3, 4 digit scale ranges and digit heights from 2.3”~18”. Indoor or Outdoor. The commercial range is ideal for the Food industry, Chillers, Freezers as well as Office and work area room Temperature comfort. Our range of Digital LED Timers and Totalizers offer many bespoke and standard options. All Timers have a Time base in Hrs Mins, Secs and combinations of these but we can also offer Long Range Timers such as Year – Week – Days – Hrs – Mins – Secs. Typical functions are UP or DOWN timing, Totalising or Batch timing, TAKT timing, Repeat Cycle, One Shot output. Alarm trips and re-transmission or direct Serial Input. Remote programmers for Time settings and Start / Stop / Reset functions. The Timers can be used Indoor or Outdoor with the appropriate Case rating protection. One of our strengths is being able to design bespoke Large Digital LED Displays around our standard software and mechanical designs, to meet your exact requirements. One display or many displays, our experienced technical staff will discuss and assist you in achieving exactly what you require, we will guide you on what is the easiest, least expensive and easy to operate solution. We have a very experienced team of software and mechanical engineers, who get involved from any project from the beginning. Please call our Sales Office or email your outline specification and we will acknowledge your request the same day. Let us then discuss with you the finer details. We are also able to visit you with demonstration units if required. 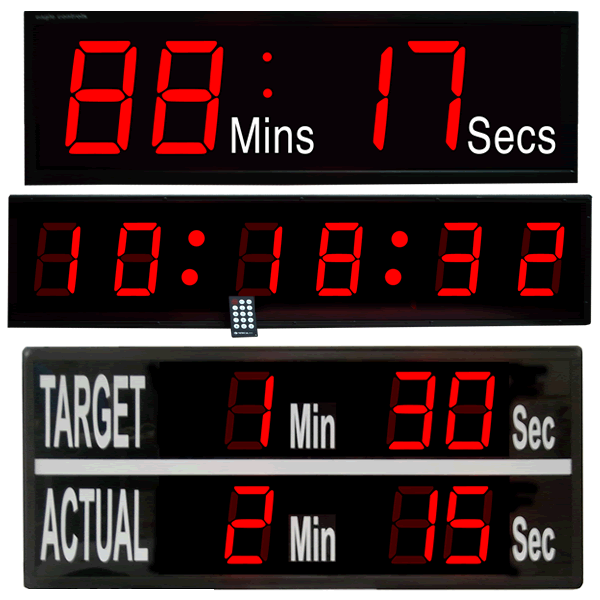 We supply one of the largest ranges of Large Digit Seven Segment LED Displays. With manufacturing and assembly facilities in the USA, UK, Europe and Far East we have thousands of large digital displays operating world wide in a hugely diverse range of applications and locations.